Red Apple Auctions in The Washington Post! You are here: Home / Auctioneers / Red Apple Auctions in The Washington Post! 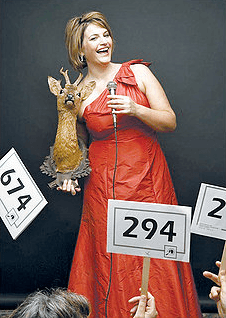 Sherry Truhlar (who has never, ever sold a mounted deer head) poses during The Washington Post photo shoot. Each week, The Washington Post Magazine has a section in its Sunday paper called “Making It.” The section covers growing niche businesses in the Washington, D.C. area. Today the section featured Red Apple Auctions. Reporter Vanessa Gezari wrote the article, which you can read on the Post’s site by clicking here. And whoo hoo! Some of my clients got honorable mentions, too. As a side, the dress I am wearing for the photo shoot has a bit of a story behind it, too. (Don’t look for me to be wearing it to any of my events.) I blogged about the $250 accident here. I remember you from the Washington Post article, so I thought I would ask you first..I volunteer for a Pet Rescue 501 non-profit..We are having a tea at the Willard in October to help pay our vet bills. We are all donations and volunteers. Looking for an auctioneer to help with our live auction..No money to offer but can give you all the info to take a deduction..can you help us? Kudos to you for reaching out! You’re recognizing that something needs to be done to improve your event. Although I have assisted with groups as a volunteer, they are groups with whom I have a personal connection. All of the auctions we work with are driven by volunteers, so your organization is not unique in that sense. Several of them also have no paid staff, so the organization management itself is also operated by a volunteers. It sounds like that might be your situation as well. If you start to follow my work, you’ll realize that I am a strong advocate of running your auction like a business. If you want your business to grow, you must take calculated risks and make (sometimes scary) investments. When you don’t, it’s only hurting the very population you serve … the animals. Consider the auction that — for 10 years — made $19,000 in their auction. After much internal debate, they made some calculated investments (better food … auctioneer … software) and made almost $70,000 this spring. I suspect they spent more money investing in their auction this year than their entire auction made last year, and the payoff was huge. Your group might not yet have hit that threshold where the time spent in organizing the auction is greater than the results you see. But when you do, give us a call. For now, it’s great to see that you are starting to seek out ways to develop the event, and I honor your desire to improve. Good luck!